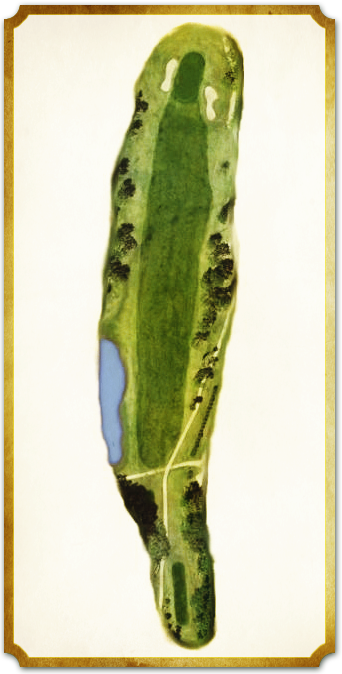 A true shotmakers hole, the dogleg right par 4 9th starts with a tee shot that must be played with a slight fade through a chute in the trees. Favor the left side of the fairway, as this will leave the best angle for your approach, directly into the slope of the bowl shaped green. With greenside bunkers on both sides, a mound on the front center of the green making a run up difficult to control, and a false rear, this green requires an accurate approach to hold. Luckily, a good tee shot leaves only a wedge to short iron for most players. Play a bit more break than you read into your putt, the subtle curves can be deceiving.